An update next month to Apple's flagship digital media player may outfit the device in an additional color but may otherwise represent a rather modest refresh when compared to years past, AppleInsider has been told. The iPod, which struck a resurgence that helped place Apple back on the map in 2001, may for the first time take a back seat to the company's more lucrative and influential devices —such as the iPhone and iPad —when the electronics maker unveils its holiday lineup of iOS devices sometime between mid-August and mid-September. For years the iPod lifted Apple as its bread-and-butter product but now accounts for a paltry 5% of the company's revenue, according data released as part of its fiscal third quarter earnings report this week. And the majority of that revenue comes from the higher-ASP iPod touch, which accounted for more than half of the 7.54 million iPods shipped during the quarter. Adding a bit more color to the matter are a series of recent industry checks by Concord Securities analyst Ming-Chi Kuo, who told AppleInsider that the iPod touch is the only one of Apple's four iPod product lines that continues to show any semblance of unit growth heading into the second half of the year. Looking into the current third calendar quarter, Kuo said checks indicate Apple has placed orders for white iPod touch models that are expected to go into mass production sometime in late August, but he added that the build plans for those models reflect few, if any, distinguishable changes from the existing black models introduced last fall. "It means no spec update of iPod touch this year," he said. And while such claims may or may not pan out, it's worth noting that the same round of checks by the analyst revealed earlier this week that Apple's production roadmap for its legacy white MacBook appeared to drop off in August, and that no future updates were expected. Within days of those checks, Apple formally discontinued sales of the white MacBook to consumers, relegating the notebook to an education-only product. Asked why he believes his checks into this year's iPod touch update will similarly prove accurate, Kuo said it's all about a priority shift towards the market-leading iPhone and the iPad, which now combine for a whopping 68% of Apple's sales. Unlike years past when Apple updated the iPhone in the summer, met initial demand, and only then began sharing components with the iPod touch in the fall, this year's iPhone refresh has been pushed inline with that of the iPod touch. 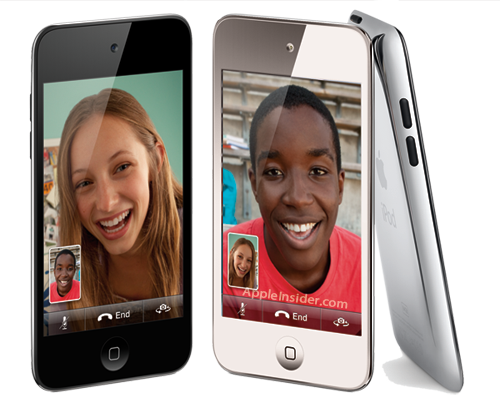 "[The] iPhone and iPad have higher priority to get shared components of iOS devices when the supply chain is tight (especially after the Japan quake)," Kuo said, suggesting that Apple has such high expectations for the fifth-generation iPhone that it may not be confident it could secure enough components to introduce a similarly-equipped iPod touch around the same time. For perspective, Apple shipped at least 33 million iOS devices last quarter, struggling to build enough iPads the entire stretch. That quarter included 20 million iPhones, and it wasn't a new iPhone quarter. The iPhone 4 actually celebrated its first birthday near the end of the 3-month span. Apple has proven that it can beat at a pace that is sometimes beyond the scalability of its suppliers, and is now pouring billions into those companies to make sure they catch up so it doesn't have to slow down. In addition to mass production of the iPhone 5 in September, Kuo says Apple has an ambitious but, for those reasons, tentative plan that could see a new iPad enter production only a few months later. Although the "plan might change," the analyst's current checks have a new iPad hitting the manufacturing lines sometime in the fourth quarter. He says, however, that it's unclear when Apple plans to introduce it to market. "Component suppliers will start to ship for next iPad in mid 3Q11 and MP date will be in 4Q," he wrote in a communication to AppleInsider. "The demand forecast is strong and Apple prefers to allocate shared components to iPhone and iPad." Kuo added that TPK currently acts as the sole source for touch-screens for white iPads but that Wintek will start sharing those duties in September. The analyst's checks aside, there's been little to no evidence thus far to suggest a material update to the iPod touch is near production. No reports have surfaced with talk of parts or supplier contracts for a new model, and even Apple's own iOS betas are already dropping hints at two versions of an iPad 3 but haven't turned up mention of a fifth-gen iPod touch. Instead, the last few releases included references (above) to an unreleased "iPod4,2," which identifies it as a player based on the existing, fourth-gen iPod touch architecture. Should Apple indeed forgo an architectural revamp of the iPod this year, the advent of a white model could serve to re-energize sales in a move similar to the one that played out a few months ago with the arrival of the white iPhone 4.